The New Journal of Daniel Faraday - which timeline is fake? And finally, the words "Imaginary time"
Which makes me think that either ALT or MTL is not real. It would be too obvious for ALT to be imaginary so maybe it is our on-island timeline that is fake? What do you think? Also anybody knows quantum mechanics? The different journal threw me as well. Since he is a musican and not scientist he can't even explain it. What is imaginary time? rocker wrote: The different journal threw me as well. Since he is a musican and not scientist he can't even explain it. What is imaginary time? Maybe the concept is similar ? It is interesting...but I am not sure if I buy that it's truely imaginary...I think it's more plausable that it would be hard to fathom that if a timeline could be altered, or rather reshaped, and so noticing that that the trajectory line would shift (parabolic mechanics) would make you wonder if any of this is even real. I think that because they remember only parts of their pasts upon rebirth it just doesn't make sense to them why they have the lives they have, becauce 1. They don't understand that this is what the Island does: it allows you to work out your issues and tries to give you the thing you want most. 2. They only remember parts of things and so I don't think they even understand themselves...just that things have been changed. However, going back to how I think Desmond does parallel Jacob Marley in Charles Dickens "A Christmas Carol" ---It could be that the second timeline is not "set in stone" as a possable future. Charles Widmore stressed that if Desmond wouldn't help, if he wouldn't sacrifice himself, that everyone/everything they know could in effect slip away...so it just depends if when Desmond goes to the rebirth, the future, if he has to change things there, bring the others back together so that they don't all lose eachother....and maybe there is still something that has to be done in regards of the island. -But Hawking pretty much told him he's not ready yet! --So we have to wonder why that is, and assume he is meant to be in the rebirth.----I think it would be silly and sad to say the rebirth shouldn't exist, I think it makes more sense that it too needs changed before it gets to a point where it can't and perhpaps humanity would be doomed??? That's an interesting question. Which timeline is real, or are they both real? Will one have to be chosen over the other? It'll be interesting to see the choices the Losties make in the main timeline on-Island once they discover the alternate timeline exists. It kind of gives credibility to MIB's offers doesn't it? Once Desmond tells Jack and company of the other timeline MIB can interject, "I told ya so!! See if you come with me there's another life waiting for you. Desmond's been there, and the rest of you can go there also." I'd like it if this becomes the case because it makes the decision that much harder for who you choose to side with. Do you stay stuck on The Island in Jacob's camp, or do you take door number 2 and flash over to the alt? I know Sayid said he doesn't feel anymore, but what happens if Desmond flashes over to the alt and back and tells him Nadia's alive in that timeline? If there's anything left of the old Sayid I think he'd for sure stay with MIB. Jack already wanted a chance at a reset, now he's got confirmation it worked so what'll keep him from choosing the alt? this would seem to suggest that the real and imaginary time lines can converge or at least intersect (which makes me think of the book Jacob was reading "Everything That Rises Must Converge"). WhiteRabbit wrote: Also anybody knows quantum mechanics? Excitingly, I've signed up specifically to answer this question. Well, in so much as real/imaginary space/time are perfectly normal concepts thrown around in physics, and their properties are just useful mathematically. For example, time travel would be described by a "closed timelike curve". 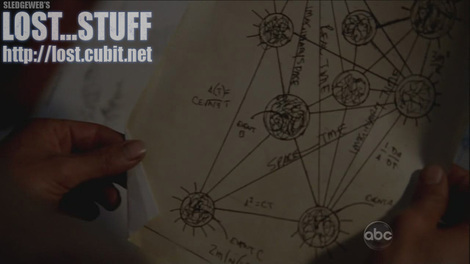 I'm sure that's why such things appear in his journal all the time, since whatever physicist the producers get on board to write in such things would know all this stuff relates to what's going on in the show. That's not to say that this physics in any way explains what is happening on the show, science is a long way from things like that!! It's just perhaps the most relevant. It's also, as far as I can see, definitely NOT "advanced quantum mechanics". All these things are more to do with general relativity, it's polar opposite (the Jacob to Quantum Mechanics' MIB). But there you go, they had to put something in the diary! maybe the numbers are also used to bring "everything" to reality. "everything what rises must converge"
whose Evolution (of the universe)-philosophy says that everything develops until an Omega-point is reached. Charlie: I feel sorry for you mate. You think you got it all. Desmond: Hmm, why because none of it's real?